The 74LVC2G241 is a dual non-inverting Buffer Line Driver with 3-state outputs. The 3-state outputs are controlled by the output enable inputs 1OE and 2OE: A HIGH level at pin 1OE causes output 1Y to assume a high-impedance OFF-state. A LOW level at pin 2OE causes output 2Y to assume a high-impedance OFF-state. Schmitt Trigger action at all inputs makes the circuit highly tolerant of slower input rise and fall times. Inputs CAN be driven from either 3.3 V or 5 V devices. This feature allows the use of these devices as translators in a mixed 3.3 V and 5 V environment. This device is fully specified for partial power-down applications using IOFF. The IOFF circuitry disables the output, preventing the damaging backflow current through the device when it is powered down. This is one package pinout of 74LVC2G241,If you need more pinouts please download 74LVC2G241's pdf datasheet. 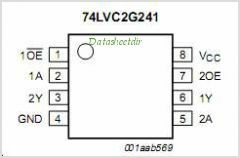 74LVC2G241 circuits will be updated soon..., now you can download the pdf datasheet to check the circuits!